Bounty Hunter Metal Detectors are manufactured by the company which is now part of the big and well-known corporation – First Texas Product. Bounty Hunter is therefore neighbor to such brands like Fisher Research Labs (which is the oldest metal detecting developer in the world, very reliable and very famous), and also to Teknetics. As you can see, there are some decent brands gathered under one umbrella corporation. Any Bounty Hunter metal detector is very easy to use, and very affordable, while being totally efficient and worth the money. These machines are extremely popular and in demand in the US. The main outstanding feature of these devices is that they are not always stuffed with fancy tuning and features, but they always bring finds. Moreover, the same manufacturer offers tools for experts, newbies, and even children. So if one is looking for a metal detecting equipment for any category of user – kid, noob, or pro – they should definitely pay attention to the Bounty Hunter metal detector reviews. For several decades, treasure hunters, especially of the entry and middle level, are happy with the quality provided by the Bounty Hunter items. This is definitely a good pick for almost any detectorist. 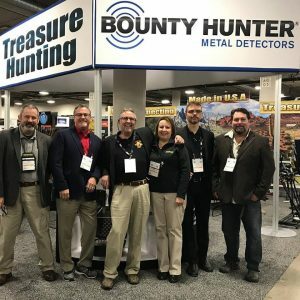 Bounty Hunter is one of the most well-known metal detection equipment companies, however, it is almost nothing we can find out about its history. It was founded back in 1973, and worked on detecting devices and accessories. Later in 1980s, this company got a patent on the technology that is now widely used in almost all items in the niche – the Target ID innovation. Back then, it was a breakthrough. In the 1990s, the manufacturer managed to reduce the costs of production dramatically due to innovative and state of the art design, making the machines both more affordable to bigger number of people, and also more comfortable and well-balanced. Very soon after that, it was purchased by the First Texas Product corporation that is an umbrella company focused on metal detecting and night vision gadgets. Yet the brand kept its excellent qualities and enjoys huge demand today specifically due to its affordability, simplicity in use but still efficiency. On this website, you will find detailed and informative reviews about metal detectors and accessories of almost any manufacturer on the market. You name it – we got it. We provide long and really objective reviews to enable the reader to research, compare, and pick exactly what he personally needs for his particular situation or preferences. When creating these reviews, we take into account several aspects. Firstly, we pay attention to actual specifications and features present in a device. Secondly, we consider our own experience with each machine that we have in our hands and apply in practice. Thirdly, we research for experts’ opinion in the field, and check their recommendations. Fourthly, we check feedback and comments from thousands of buyers and users from all over the globe. As a result, the reader on this website gets an objective and comprehensive assessment of each model. Bounty Hunter is one of the brands we love and respect, since it enjoys positive comments from buyers and professionals, so check out reviews for some of the devices by this famous company. While it is always good to have a high quality, reliable, and effective metal detector for your kid, do not forget that the first task in this case is to allow the child to have fun and discover something new for them. So, while you really want a high-quality machine, it must not be complicated, because the kid will quickly get bored by all these settings. Bounty Hunter is one of the manufacturers that is able to meet these requirements to the fullest. This is the exact reason why newbies and kids (and newbie kids!) live this brand. It combines efficiency and simplicity, so even a child is able to spot objects on different locations without racking their brains over discrimination or whatever else. Another important aspect to consider is the fact that efficiency and quality of the Bounty Hunter is combined with attractive price. Everyone knows that kids lose interest to new toys and activities pretty fast. Or, they can accidentally damage the equipment. Therefore, it makes no sense purchasing a really expensive item, even if the kid is accurate and willing to try metal detecting out. If the kid becomes passionate about it, you will still have to replace the current piece with a more advanced model very soon. To make an informed choice, check out our reviews. Bounty Hunter Junior metal detector is one of the best picks for a kid. The weight is only 1,1 lbs which is totally perfect for a small seeker. The length of the shaft is adjustable, so you can set the most suitable indication for the kid. The operating frequency is 6,6 kHz, close to universal for spotting objects made of different materials. The device gives signals through external speaker, the volume of the signal cannot be tuned as it increases depending on the proximity to the target. This is a great feature, in fact, since the child will be able to quickly learn the principle of detecting. Plus, for many kids analyzing the increasing and decreasing volume is more comprehensive that checking indications on the display. The display of this model only shows the depth of target’s location. The item is also equipped with discrimination to filter signals given by junk in the ground. The small seeker is unlikely to be amused digging out bottle caps. The search coil is 6,5 inches, also good for various objects. The depth of reach is about 5 inches, not much for considerable finds, but totally fine for coins, lost jewelry, phones, and toys. This tool will be fine for children in the age from 6 to 10. This is a bit more toyish item, and the fist difference one notices is its design. This does not look like a serious machine, but the kid will still get finds with it, mostly modern like coins, jewelry, toys, etc. It weights 1,5 lbs which is an allowed weight (remember that small children should not carry heavy objects, especially for prolonged periods of time and especially when the back is not loaded evenly, like in the case with metal detectors). The length can be adjusted. Operating frequency is 6,6 kHz, good news is that the coil is waterproof. This device is equipped with very child-friendly black-and-white display with three Target ID regimes and three tones. The display shows the depth of the target and battery life. Discrimination is also available to filter the sounds from trash. While some find the design a bit too toyish, there is one really cool feature with it that many kid metal detectors lack – a stand to support the tool when the kid puts it on the ground to dig the target out. Even grown-ups sometimes damage their equipment when it falls accidentally on the ground. With the stand, your child’s tool will be more protected. This piece is a bit more costly than the previous one. The main specs are: 6,7 kHz frequency, 2,6 lbs of weight (a little too much for younger children of 6-9 years of age we would say), headphones are available and included to the kit, discrimination to eliminate signals from trash, 8 inches coil. You will find a wider range of tuning for Bounty Hunter Gold Digger metal detector. It has automatic ground balance, sensitivity levels, treasure meter that checks the signal’s strength, and the best part is 2 feet depth of reach. Due to tuning and more features, it can be a good decent tool for seekers aged from 9 to 13-14 years. The design is also more stylish. At the same time, the display is very simple and controls are easy to use, so the learning curve won’t be too steep for any age. Please take notice that perhaps it is better to purchase for taller kids due to the length of the shaft, it is adjustable of course, but still longer than in the previous two. In all aspects, Gold Digger by Bounty Hunter is a cool choice for young detectorists to start with. There are several aspects that make teenagers and adult beginners similar in terms of choosing a metal detection machine. That is why these two groups can pick items with the same characteristics. Firstly, most teenagers are more or less of the same height as adults, and they are also physically ready to carry heavier objects for lengthy periods of time. Generally, metal detecting is still an exhausting activity sometimes, and even a physically strong adult can damage their back carrying a heavy metal detector in one hand all day long. So both teenagers and adults should look for lighter models in any case (unless there is no other choice). But overall teens cope greatly with heavier machines. Secondly, teenagers are usually in love with more complicated technologies, and being able to analyze and interpret indications and signals make them proud and happy. The same is true for adult beginners – it is always nice to make head or tale of the equipment and spot some valuable finds, while not racking their brains over each and every setting. To cut the long story short, both adult and teenage noobs can opt for one of the following items we can recommend. Bounty Hunter Tracker IV is an all-purpose single frequency machine. Bounty Hunter tk4 Tracker iv metal detector performs with the frequency of 6,8 kHz, has 8 inches round waterproof coil, adjustable discrimination, automatic ground tracking feature, two search modes (without pinpoint), is powered by two 9-Volt batteries with battery life 20-25 hours. As you can see, these specs make Bounty Hunter Tracker iv metal detector a very decent piece for a beginner. Other advantages include the ability to interchange search coils, adjustable length of the shaft, interchangeable headset, and convenient design. Among drawbacks are price (moderate, but may be a bit too much if you want to get a tool for a teenager), no depth indication (which is a very serious disadvantage, since newbie detectorists have troubles defining how deep they should dig), no vibration type of signal, no volume control. Also, it is not equipped with a proper display, posing additional difficulties for noobs; many consider visual information on targets and tuning more comprehensive. The good news is that the item is well-balanced, reliable, can be used in wet weather and for shallow water search. An absolutely perfect pick for a beginning treasure hunter. According to feedback from the users, this piece is easy to tune and shows nice stable performance on almost every location. It weights 2,8 lbs, has 8 inches coil, 7 kHz single frequency, and LCD display. The disadvantages are as follows: no depth indication (no exact depth, only three approximate levels), only one search mode, no volume control. The device’s coil is waterproof, the battery life is very decent – from 20 to 25 hours of two 9-V batteries. The headphones and coils can be changed for other models. Bounty hunter gives 5 years warranty for this product, which is very impressive; obviously the manufacturer is confident in quality and reliability. Considering the price, it is a perfect piece for teenagers and adult noobs who would like to try treasure hunting out as a hobby. Due to presence of the target ID feature, it will bring a lot of finds even to seeker with no experience. Some skills are needed to tune the device, but once the user learns how it works, there is nothing complicated about it. Quicksilver is well-designed and balanced enough to make long hours of searching comparatively comfortable even for a teenager. Those who already has some experience in metal detecting would probably love to get some more advanced tools for their hobby. In this case, Bounty Hunter is one of the companies that offers a wide range (perhaps wider than other manufacturers) of affordable, yet efficient and tunable instruments. Bounty Hunter as a brand is especially loved by middle-level treasure hunters, because they can tune the machines without complicated skills, get the finds, but pay an adequate price for machine. It is easy to pick a suitable item for middle-level detectorist, the most important aspect to pay attention to is features. The detectorist just has to assess objectively what features he can cope with and what are yet too advanced for him. Some people just do not need certain features, for example, totally isolated and waterproof detector makes no sense to those who never searches in waters deeper that a foot or two. So check the features, make sure the specs suit you, and opt for the supreme machine in your preferred price range! Bounty Hunter Land Ranger Pro is a comparatively expensive piece. Its weight is 2,5 lbs, the single operational frequency is 7,69 kHz. The coil is 11 inches DD type, the tool is powered by one 9-Volt battery. Boasts three search modes plus electronic pinpoint, the ground balance is preset, Target ID has nine levels, sensitivity and tone are adjustable as well. Bounty Hunter Land Ranger Pro metal detector has a stylish design, convenient armrest, and a decent display. The depth indication shows five segments. The buyers state that due to combination of preset and customizable features, this tool stays with the user for long years, as the user becomes more skillful with tuning the piece with time, and the piece provides more and more accurate performance with proper tuning. This is an unusual characteristic for a metal detector, so those middle-level hunters who would like to enhance their skills in the future should pay attention to this product. They will be able to learn and grow as the item allows efficient search for users with different level of skill. In addition, Land Ranger Pro is one of the supreme products within those made by the Bounty Hunter but yet affordable and easy to learn with. Bounty Hunter Lone Star Pro metal detector is very affordable. The frequency is 7,69 kHz, weight 2,5 lbs, equipped with eight inches waterproof coil. LCd display has a touch-pad, sensitivity and discrimination can be tuned, powered with one 9-Volt battery. The ground balance is preset, notching system, Graphic Target ID and three tones audio are available. This item enjoys very positive feedback from customers, claimed to be a machine for those who wants to learn and enhance the skills. It is just a tiny bit more primitive than the previous model in our list, but it also makes a learning curve less steep for middle-skilled treasure hunters. The display is especially useful as it is comprehensive and also pretty clear in terms of quality. The design is mostly standard, which means no unpleasant surprises. If you are a treasure hunter with certain skills, and you are planning to improve them and master new levels of complexity while metal detecting, Lone Star Pro would be a good pick. Another more costly product by the Bounty Hunter. Pretty much very similar to the two previous positions in terms of warranty, weight, frequency, battery, and all those main features. It has 10 inches waterproof coil, and three sections depth indication if we want to name the differences. Another advantage is presence of 0 to 99 indications of Target Identification, which is cool for more accurate and efficient digging. The actual users state that target identification is the primary difference between the Quick Draw Pro and Lone Star Pro, which also means that this one is easy to set, simple to use, adjustable and reliable, and allows space for experiment and learning with the settings. Not a bad machine to begin with. Nice convenient design is topped with clear and comprehensive LCD display. Clean identification and availability of pinpoint enables the user to spot objects quickly and properly, without becoming exhausted quickly. This Discovery 1100 model has a disadvantage that should be noted right away – its weight is 4 lbs, so if you have health issues with back or shoulders, or generally with joints, than it is better to avoid this model. It has a nice and balanced design, but definitely no design can compensate the heaviness. Another disadvantage is price – this tool is way pricier than the previous three in the section. You are the one to decide whether it is worth the money or not, so check the tech specs first. As for us, we believe if you can afford buying Discovery 1100, you can also choose a lighter machine by a different brand. It is generally similar to three previous models in terms of technical specifications. What we also do not really like in this piece is its display – the panel is large, but stuffed with tiny indications and letters, and the display itself is not that big. You will definitely need eye glasses to see what it tells, especially on a sunny day. It is the control box and the panel with display that are suggested to make it this heavy. It is also waterproof and all that jazz, and the reason why it is here in our list is because it is a good piece of equipment you can take advantage of. But it also has several serious drawbacks so just make sure you assess all pros and cons. Bounty Hunter equipment is loved by metal detectorists all around the globe due to its affordability, simplicity of use, but at the same time efficiency. items by this manufacturer bring finds even if they are created for total noobs or children. So it is possible to opt for the most suitable tool regardless of the level of skills. To opt for a machine for younger children in the age from 6 to 10, check out Bounty Hunter Junior. Its best features include super small weight, simple display with depth needle only, and decent discrimination. To choose an instrument for a teenager or adult beginner, look for a bit longer and heavier and a bit more complicated models, for example Bounty Hunter Tracker IV. Among its advantages are battery life and interchangeable coils; its wide range of specs and features make it perfect to begin with and continue to learn metal detecting. Treasure hunters with middle level of mastery can pay attention to Bounty Hunter Land Ranger Pro. In addition to 11 inches DD coil, four search modes, target ID, automatic ground balance, and more fancy stuff, this tool has an important characteristics – the user can apply more and more complicated settings as his master grows, so this machine will be a reliable equipment for many years.